For the two years we’ve lived in this house, the wall above my bed has been woefully vacant. I’ve long wanted to put some kind of art there, but I couldn’t figure out exactly what. I’ve tossed lots of ideas around in my mind but it wasn’t until I saw this crazy panda print at CB2 that things began to gel. Though I liked the panda and the print’s large size, I knew I wanted something a little less wacky and a little more personal. When I was asked to try out Mod Podge Photo Transfer Medium I decided the time was ripe to make my idea a reality. I knew I wanted something pretty big, so I went to a home improvement store and picked out two 24 inch square pieces of plywood. 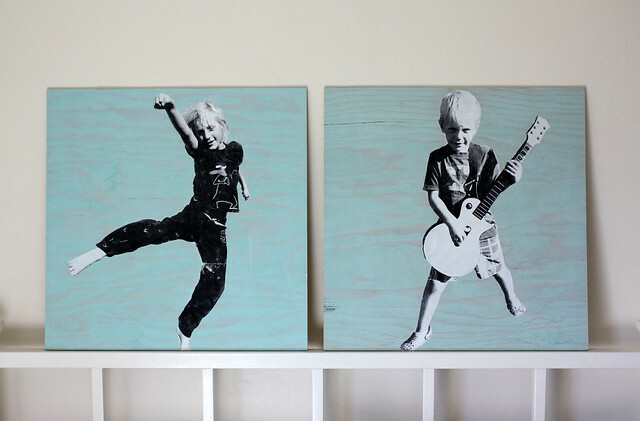 My idea was to have a fairly bright background with large black and white images of each of my kids on them. I was shooting for something bold, graphic and cool but also clean and simple so it wouldn’t be dated before the year is over. I’m thrilled with the results! I took these photos especially for this project. I wanted something that the boys would think was cool and that also reflected their personalities, so I took each of them outside and posed them in front of a blank wall and asked them to do things they thought made them look cool. For my older son, that meant lots of kicks and jumping and punching. For my little guy it meant posing like a rock star and pretending to play our Wii guitar. After taking dozens of photos, the kids and I selected the best photo together and then I erased the background in Photoshop Elements and converted the photo to black and white. Once I’d nailed down the photo composition, I took my files to a local copy shop on a thumb drive and asked the technician to print them out in black and white on 18 x 24 inch paper. The prints cost a little less than $4 each. It’s important to note that the photo transfer medium does not work with inkjet printers (which is what we have) so I would have had to photocopy any photos I printed regardless of size. Next, cut the image out. Any border you leave on the paper will show up after you transfer the photo, so cut as close to the edge of the image as you can get. 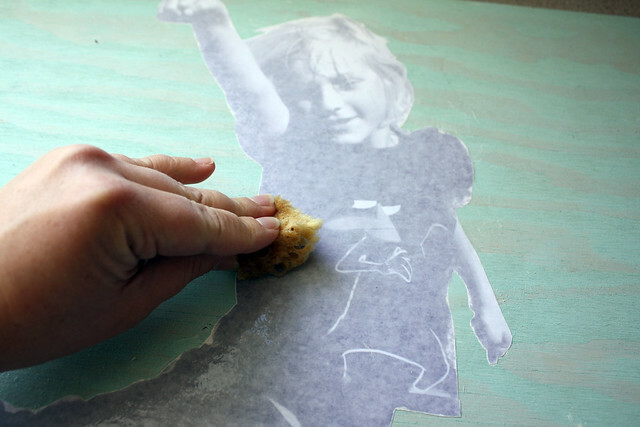 Once the image is cut out, lay it on a sheet of parchment paper slightly larger than the dimensions of the photo. This will protect your work surface and it will also make it easier to transfer the large, floppy image to the board. 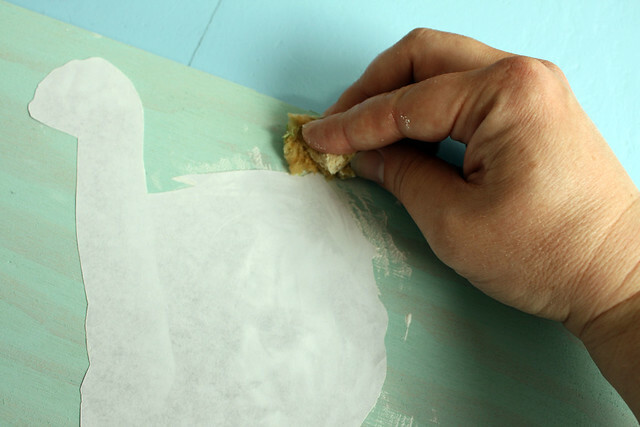 Use a paintbrush to cover the front side of the image with a fairly thick coat of the transfer medium. It’s OK if a bit of the image shows through, but it should be pretty hard to see. 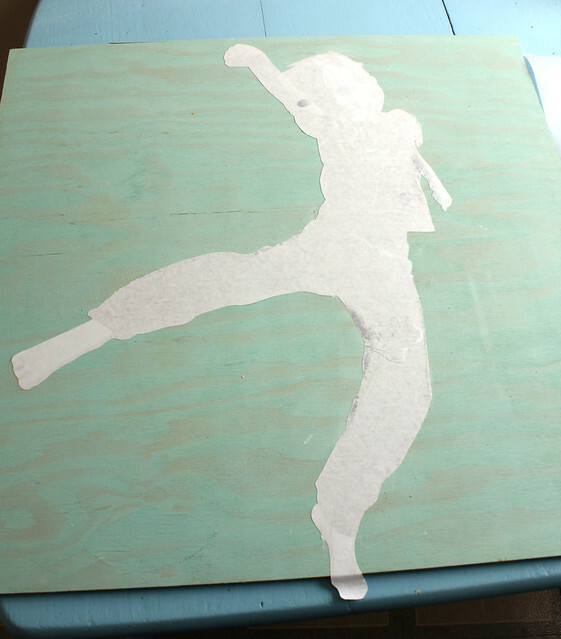 Place the image on the painted board, placing the side that’s covered with the transfer medium against the painted surface. The paper will stick to the parchment pretty well, so before you press it against the board, take a moment to arrange it where you like it. I wasn’t quite careful enough with this step, and part of my image didn’t make it onto the board. It’s not a big deal, but I would have preferred it if the whole picture had made it on. When you have figured out where you want the image, press it lightly against the board and then peel off the parchment paper. 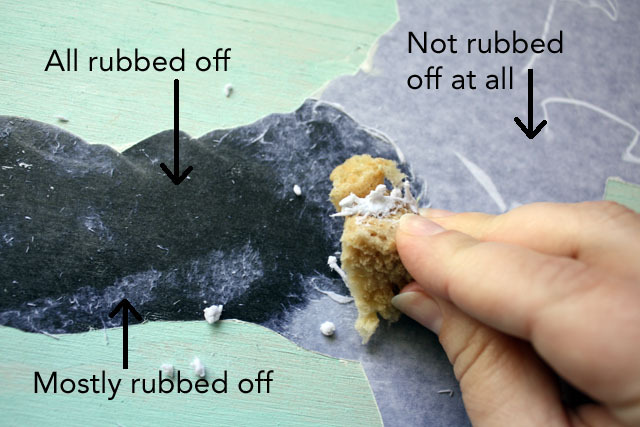 Try to avoid pressing down on the edges of the image before you’ve removed the parchment paper because the excess medium on the edges will transfer to the board as well. Guess how I know that? Starting in the middle of the image and working toward the edges, smooth the paper out to remove any air bubbles and to make sure the entire surface is stuck to the board. If any excess medium has made its way out from under the paper (or if you smeared it all over the board accidentally) wipe it off with a damp sponge or cloth. Do take care to get all the extra medium off because it does not dry clear. Allow the paper to dry completely without disturbing it for 24 hours. Once those 24 hours have passed it’s time for the big reveal! Begin by wetting a sponge and tapping it over the entire image. Be sure all the paper is saturated with water, then let it sit for 2 minutes. Once the paper has absorbed all the water, it’s time to rub it off. Rub a small sponge in a circular motion over the top of the paper. 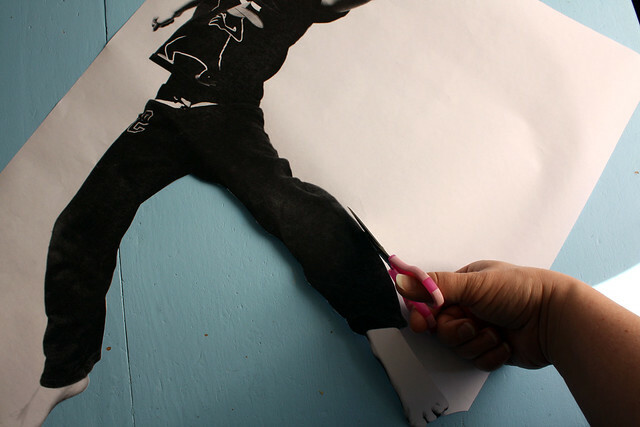 The paper will clump up and rub off the image. I found that it was very easy to get most of the paper off, but the last thin layer of paper fiber took a while to remove. Be patient and keep rubbing until all of it comes off. It helps to rinse your sponge and wring it out pretty frequently. Ta da! All done! The image transfer worked really well, but I should note that it’s not completely perfect. The image didn’t transfer completely in some places and the edge of the transfer is coming up a little in some places but I don’t care because I love how they look! The imperfections make it look a little grungy and a little cooler — perfect for a kung fu master and a rock star! I was planning to give the boards a coat of regular Mod Podge anyway so it would have a bit of shine, so I’m sure that will take care of any loose bits. 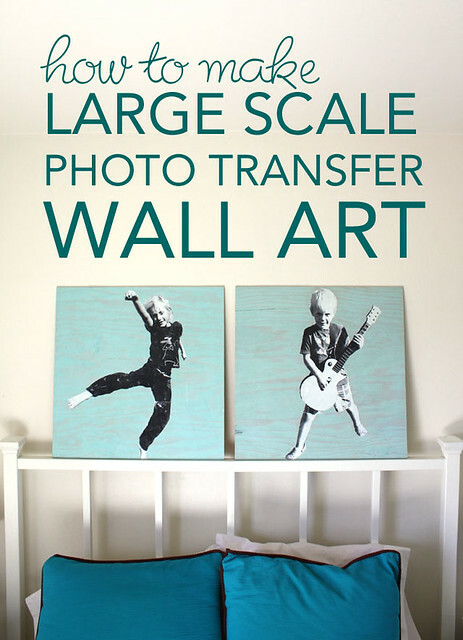 I was really happy with how the Mod Podge Photo Transfer Medium worked for this for this project because I could use it to make a large, personalized art piece using photos of my boys without having to drop a small fortune having a big canvas or something printed up. All told the materials I purchased for this came out to less than $10 per board. Not too shabby for pieces that cover 8 square feet of wall space! 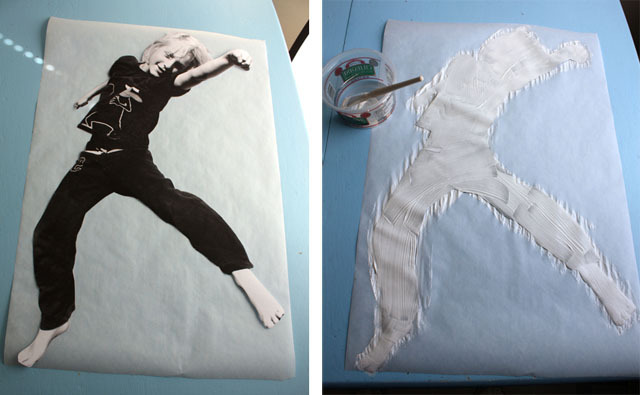 The Photo Transfer Medium works on any hard surface and also is machine washable when used on fabric. My mind is spinning with ideas for how to use the rest of the bottle!